If you're looking for portability, there's plenty of options out there. While Dell turned heads back in 2015 with its Infinity Display on the XPS 13, you have to decide if you want an Ultrabook, a tablet, a convertible like the Yoga Book, or to just use your phone. 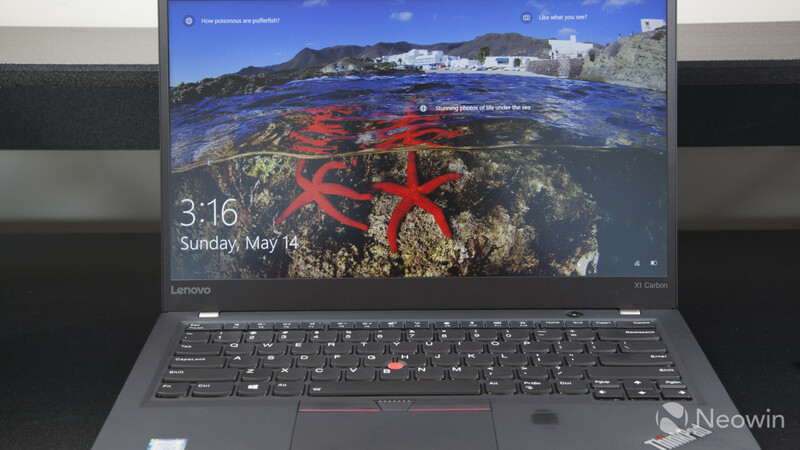 Today I'm going to take a look at the Lenovo ThinkPad X1 Carbon. This is the 5th generation of the X1 Carbon, and as its name implies, it's built with a carbon-fiber reinforced chassis. 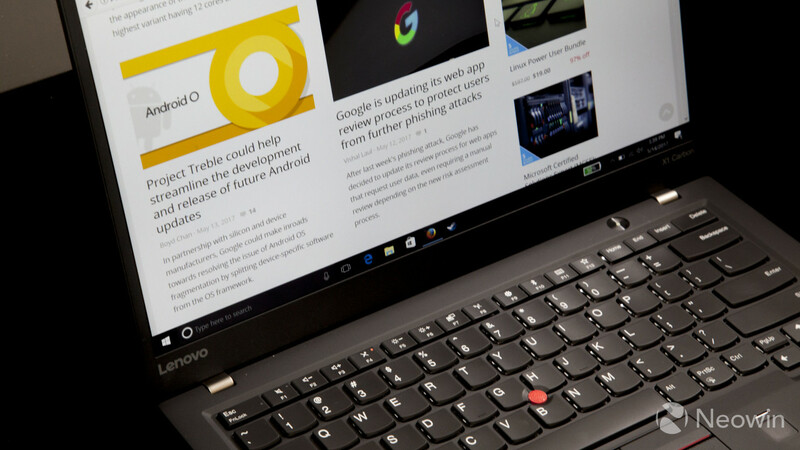 Starting at just over $1,300, the device sports a thin bezel (although not Infinity Display thin), solid construction, and the iconic Lenovo ThinkPad keyboard, complete with TrackPoint (the red mouse nub). The Lenovo ThinkPad X1 Carbon comes in five base configurations, ranging in price from $1,322 all the way up to $2,340. All of the configurations provide the same form factor as well as the same 14" Full HD (1920x1080) IPS screen. It's important to note that the X1 Carbon does not offer a touch version, which seems strange for a new release, although a new Quad-HD display is expected in June so Lenovo may add touch to that screen. All of the displays are powered by an on-board Intel Graphics 620 card. The base configuration has an Intel Core i5-7200u processor and comes equipped with a tiny 128GB SATA3 SSD, which I doubt many people will keep. 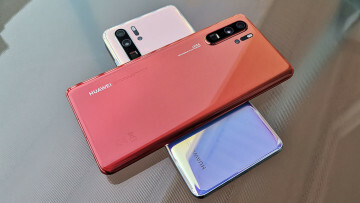 It also includes 8GB of RAM, a 720p webcam, a fingerprint sensor, a ClickPad with three dedicated mouse buttons, and a TrackPoint for the old-school users. If you want to equip your ThinkPad X1 Carbon with 16GB of RAM, you'll need to bump up the CPU, as that requires the Intel Core i5-7300U or i7-7600U. The RAM is soldered onto the board though, so if you want to upgrade, you need to do it at the time of purchase. The model that Lenovo provided me for the review was powered by the Intel Core i5-7300 running at 2.60GHz, had 8GB of RAM, and a 256GB SSD. Wireless connectivity is handled by the Intel Dual Band Wireless AC(2x2) 8265 chip, which also supports Bluetooth 4.1. In addition, for those who need to be online while on the move, the ThinkPad X1 Carbon has an option to install a Qualcomm Snapdragon X7 LTE-A modem for an additional $140. 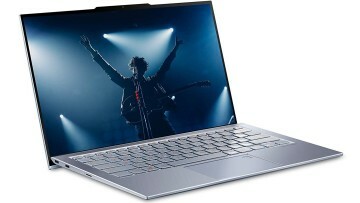 When it comes to connectivity, the X1 Carbon sports two Intel Thunderbolt 3 ports (USB-C), one of which can be used to charge the device, two USB 3.0 ports (USB-A, one one each side of the laptop), and a full-sized HDMI port. There's also a standard headphone jack and a Kensington lock port. 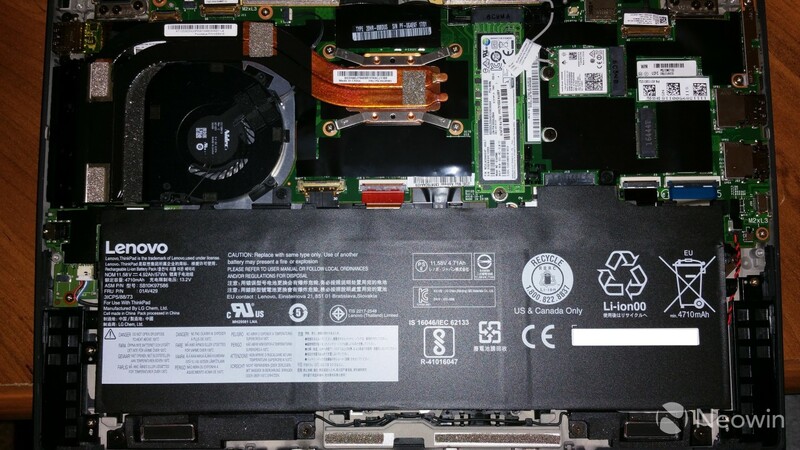 Along with what was described above, there's a Discrete Trusted Platform Module (dTPM) chip embedded in the machine. This is the most secure implementation of TPM, due to the fact that it's a dedicated chip, thus reducing the ability to attack it via software. The design of the ThinkPad X1 Carbon isn't going to turn heads at the airport or make your friends jealous. It's not an ugly design by any means: The bezel is unobtrusive, the screen is sharp and bright, the shell is rubbery and grippy, and the carbon fiber gives the device a premium feel. The one negative, however, is that the matte rubber surface collects smudges fairly easily. 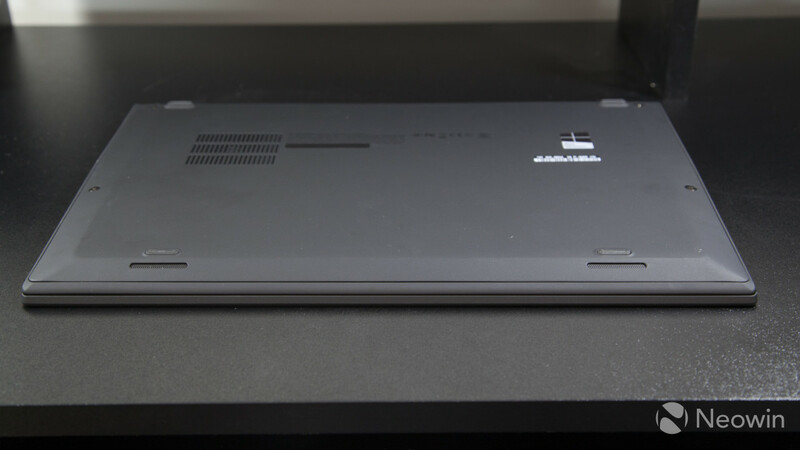 One of the best design decisions Lenovo made was with the laptop hinge. With the ThinkPad X1 Carbon, you have the ability to open the screen 180 degrees to lay the device down perfectly flat. 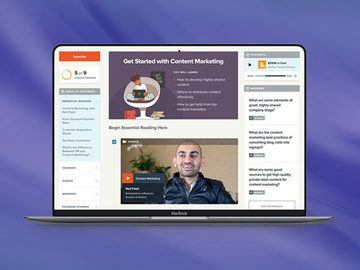 I found that it was great to have the laptop completely open while sitting on the couch and reading websites. The only thing that could've improved the design here would've been a touchscreen so that it's easier to scroll through pages. 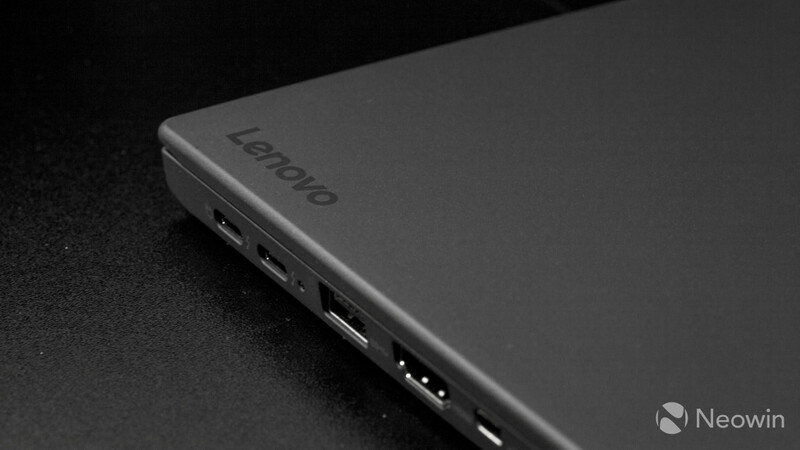 Once you sit down and start using the device, you notice the little things that Lenovo did to make the X1 Carbon a pleasure. If you're a fan of the traditional Lenovo ThinkPad keyboard, it's still intact here, with the iconic nub (TrackPoint) between the G/H/B keys for those who prefer it to the ClickPad. 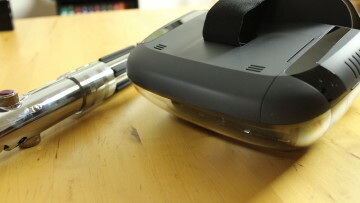 Speaking of the ClickPad, instead of using virtual buttons like many other laptops, there are three physical buttons placed above, and two hidden mechanical buttons at the bottom. The lower end devices comes pre-installed with Windows 10 Home edition, which is a strange decision by Lenovo considering the target market is clearly the enterprise. The upgrade to Windows 10 Pro is only $30, so I suspect most people will either order one of the more expensive models, or simply pay for the upgrade. The X1 Carbon sticks with its roots in the input department, coming equipped with the standard high quality ThinkPad keyboard, the TrackPoint, and a ClickPad. Sadly, as we'll discuss later, the device does not have a touchscreen. The keyboard is the star of the show, as anyone who has used a Lenovo laptop before can attest to. The keys are raised up fairly high and have a good springy feel to them so that you definitively know when you've pressed one. The keys are also full sized and have a good amount of space between them, making using the keyboard similar to that of a desktop. If you like to have a back-lit keyboard, you can turn that feature on by pressing the function key and the space bar. 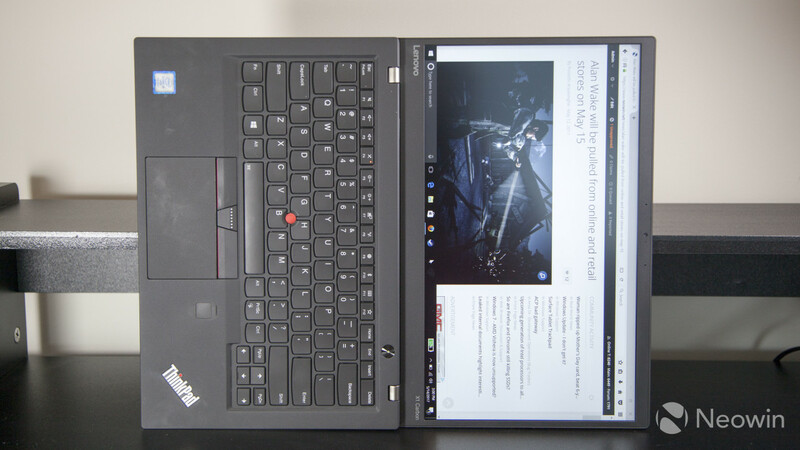 The X1 Carbon has dedicated page up and page down buttons, unlike some of its competitors, which is extremely handy when browsing websites, especially given the lack of a touchscreen. The keyboard isn't perfect though, and the biggest issue for me is the fact that the function key is placed to the left of the control key. As someone who uses control shortcuts, I found myself pressing the wrong key many times and trying to figure out why it wasn't working. 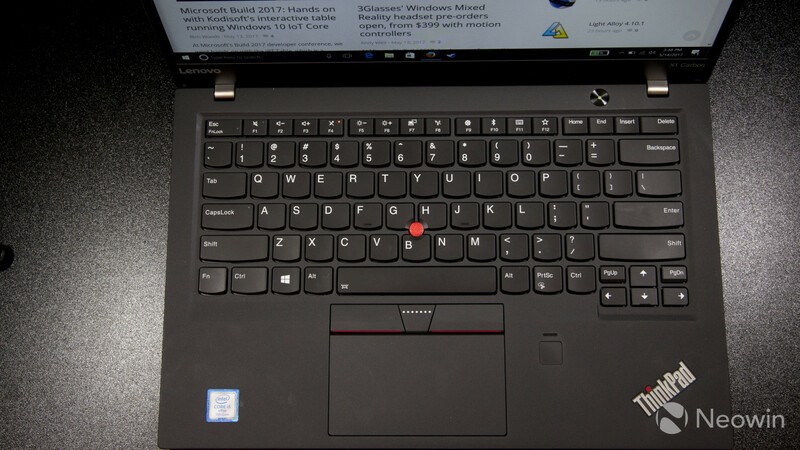 This is a personal preference, and something that one would get used to with repeated use, but since most manufacturers put the control key all the way to the left, I'm not sure why Lenovo didn't follow suit. When it comes to mouse controls, you have two options with the X1 Carbon: The iconic red TrackPoint (aka: pencil eraser or nub), and the ClickPad. 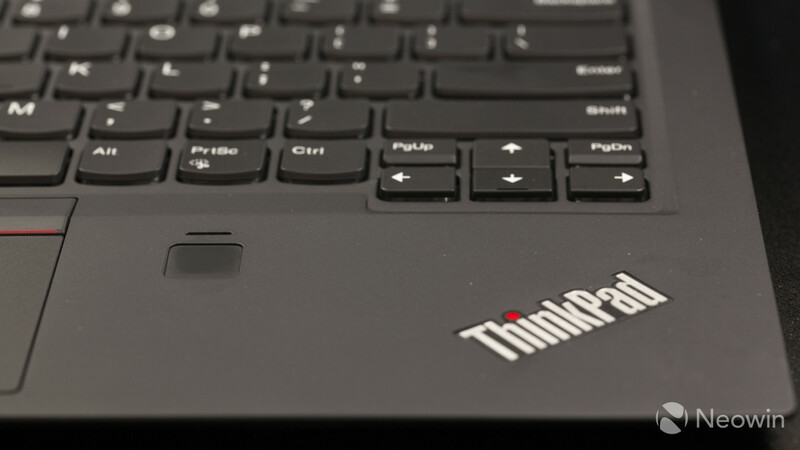 Lenovo has kept the standard TrackPoint from the old IBM days. 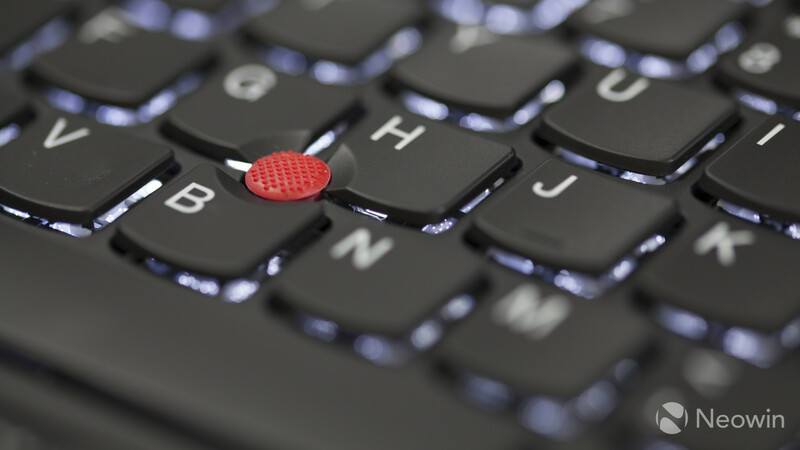 For those who haven't used it before, the TrackPoint is a little red nub that sits in the center of the laptop, and by pushing it in different directions, you control the pointer on the screen. It's been a great input device for years, and in addition to the fine tuned control it provides, it also lets you move the mouse cursor without pulling your hands off of the home row of the keyboard. Unfortunately, I encountered a serious flaw with the TrackPoint on the Carbon X1: The ClickPad's integrated mouse clicks don't seem to work with the TrackPoint. 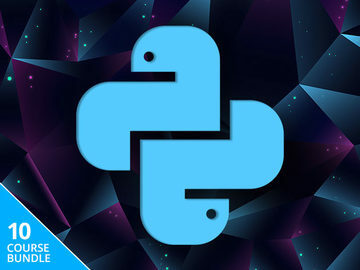 When pressing the left mouse button on the ClickPad, and then dragging the mouse with the TrackPoint, the system releases the click after a fraction of a second, making it impossible to select text in a Word document, use MS Paint, or any number of other things. The TrackPoint does still work with the physical mouse buttons at the top of the ClickPad, though. For those who don't want to use the TrackPoint, the ClickPad works great and acts like most other trackpads you've used in the past, including the standard array of finger gestures to scroll and zoom. For example, tapping four fingers on the Clickpad brings up the Windows Notification Center, and swiping with three fingers lets you replicate the Alt-Tab functionality to switch between apps. Where Lenovo's implementation is a little different than some others is the fact that in addition to the three physical buttons above the ClickPad, there are also two hidden buttons at the bottom. Pressing them gives a good "click," so you know you did it right, unlike the virtual ones that are available on some other offerings. I thought I'd end up using the top buttons more than I actually did. With all of the recent laptops not having these physical buttons, I find I'm missing them less and less, but it's still a good feature to add for those who want it. 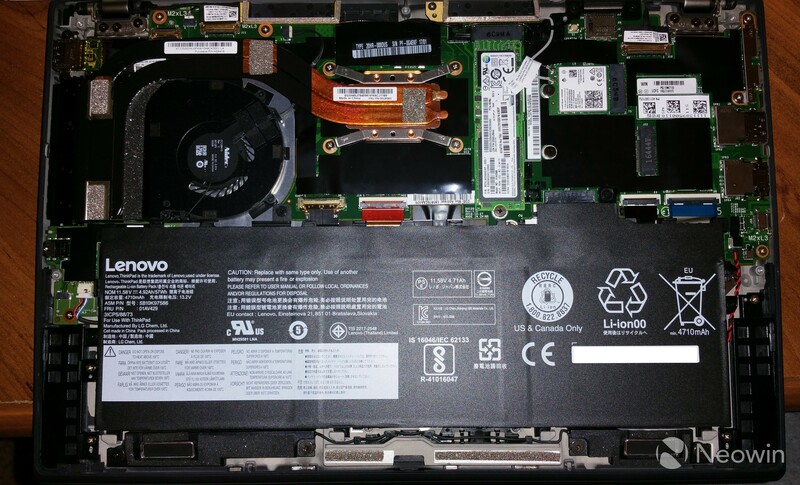 Lenovo claims that the ThinkPad Carbon X1 has a battery life of "up to 15 hours." That's a generous assessment for any mobile device, but I found that in my testing of the device, it never really came close to that. That said, under normal use of browsing websites, typing up some documents, and watching an occasional YouTube video, I was easily able to last just over 10 hours with the brightness set to roughly 50%. Your mileage will obviously vary based on what you're doing, but the battery life definitely does not disappoint. Perhaps more importantly is how quickly the battery charges. The X1 Carbon uses a Thunderbolt 3 USB-C port to charge, and can go from 0% to 80% in roughly an hour. That's enough charge to give you another 8 hours of normal use. The screen is the one thing that really disappointed me about the X1 Carbon. From recent reviews, I've come to expect not only a high quality screen, but one that also provides touch as an input. Although I've seen many people say touch is not necessary, it definitely does make a device easier to use, and I frequently found myself trying to scroll through webpages or click buttons by pressing the screen, so the lack of that feature is a severe disadvantage compared to Lenovo's competitors. The screen resolution is limited to only Full HD (1920x1080), and while this isn't a show stopper, it's nice to hear that Lenovo is planning on releasing a Quad HD (2560 x 1440) display in June, although I didn't receive any other details about the upcoming release. The screen itself has good brightness, at 300 nits, and the display is sharp and crisp. In some ways, the lack of a QHD display is a good thing, as Windows 10 occasionally has scaling issues when running older software, and with only a 14" screen, the additional resolution isn't strictly necessary. For those who want to save battery life, running at 30% brightness in a normal office environment was still easy to use. As with any Ultrabook, we have modest expectations when it comes to audio because there's just no way for manufacturers to bypass the laws of physics when it comes to the size and depth of a speaker. 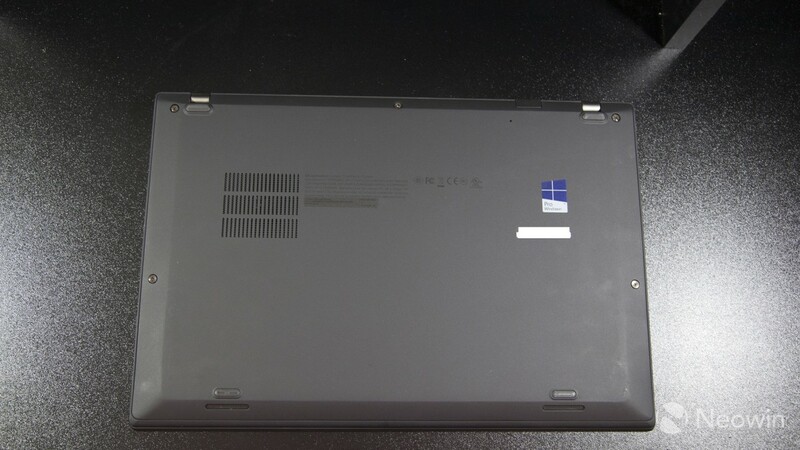 The X1 Carbon places the speakers on the bottom of the laptop, underneath the palm rest. The result is a mixed bag. When using the device on a flat surface, the sound is actually pretty good, for a laptop. Cranking the volume up doesn't cause much distortion, and unlike some other devices, I was able to actually enjoy some music. 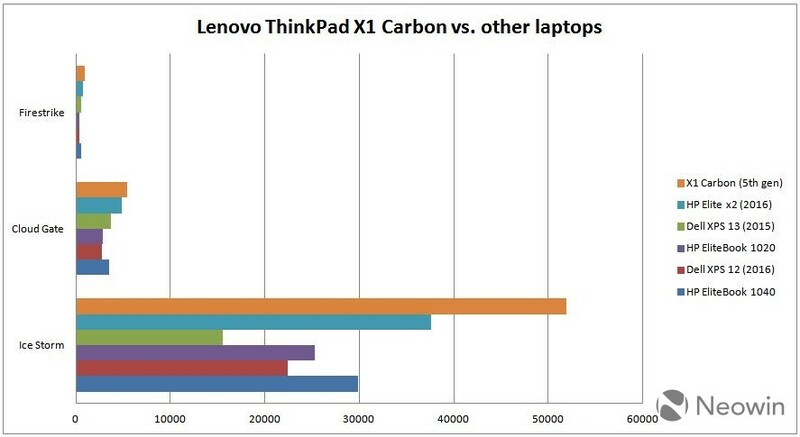 If you're using the ThinkPad X1 Carbon on your lap, it's a whole different story. Because the speakers are up front and aim down, the sound becomes muffled and practically unusable. I would recommend switching to headphones if you're using the laptop while sitting on the couch. All of the design, appearance, and features mean nothing if the device can't work as your daily driver. Luckily, the X1 Carbon has great performance to go along with its nice array of features. As with all Ultrabooks, this one is powered by a relatively weak Intel 620 graphics card, so don't expect strong video game performance. However, since the target market for the device is the working professional, that's not surprising. 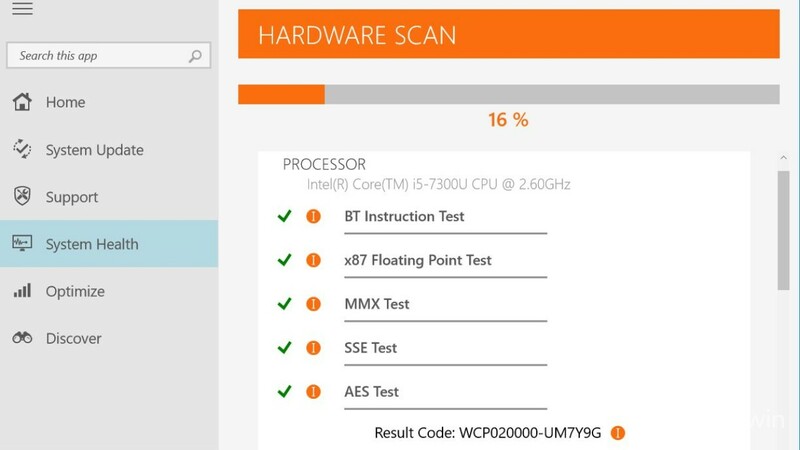 I began by running the X1 Carbon through the PCMark Creative, Work, and Home tests, and the device managed to crush the competition, besting the HP Elite x2 that I reviewed late last year. 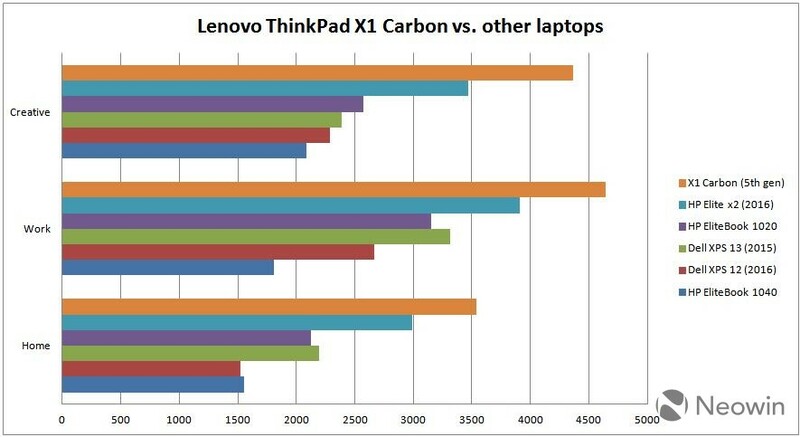 How much that translates into real world performance is up for debate, but it's clear that the latest ThinkPad X1 Carbon can easily run whatever productivity workloads you want to throw at it. On the gaming side, the results were still better than any other laptop I've reviewed, but the difference wasn't as dramatic and again, I doubt most people will be able to notice on most games. The Ice Storm test was the only notable exception, clocking in nearly 40% higher than its nearest competitor. 3dMark has also released a couple of new benchmarks that I've never run before. Without knowing how previous laptops faired in the test, it's hard to say if these results are good or not, but I'll include them for future reference. On the first test, Time Spy, the X1 Carbon scored 279. The second test, API Overhead, is measured differently. Instead of a single number to represent performance, the test breaks the results down into four categories: DirectX 11 Multi-threaded draw calls per second (518,698), DirectX 11 Single-threaded draw calls per second (483,603), DirectX 12 draw calls per second (2,216,076), and Vulkan draw calls per second (1,594,440). 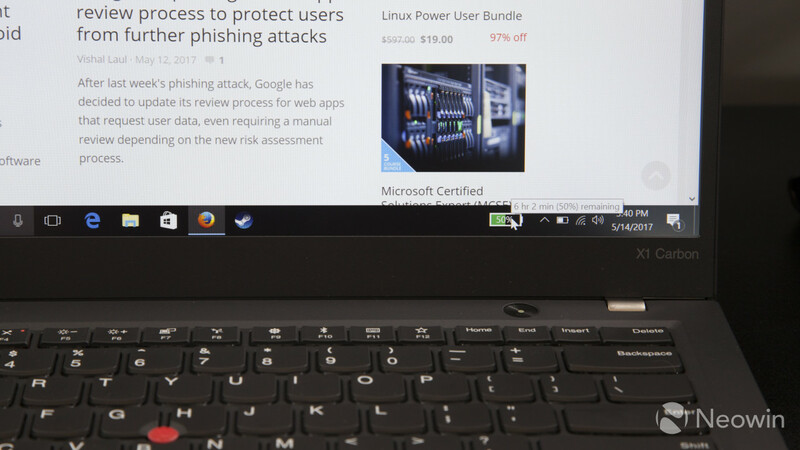 One of the biggest selling points for the Lenovo ThinkPad X1 Carbon over some of its competitors is the security features that it builds in. The fingerprint sensor, for example, is the best I've ever used on a laptop. 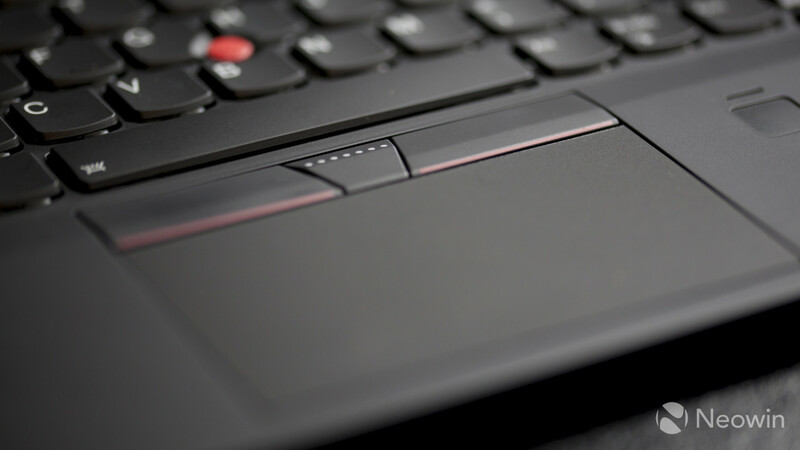 Unlike cheaper models that make you swipe your finger over the sensor in order to read it, the X1 Carbon lets you simply press your finger on it to unlock your machine. The device also has a dTPM chip, which is the most secure and most expensive implementation of TPM. The chip is dedicated to security, and includes tamper resistance as well. Since services like BitLocker rely on TPM to function, this provides extra peace of mind. In addition, the inclusion of vPro will give enterprises an easier way to manage and control the X1 Carbon. Another great selling point for the ThinkPad X1 Carbon is the fact that it includes both USB-C and USB-A ports on the same device, something we're starting to see less of on the market. With all of the various USB-A devices (especially thumbdrives) available, it's a good idea to keep these around a little longer. Finally, it looks like Lenovo is keeping bloatware to a minimum on the device. There's a few Lenovo-specific scanning tools to check the health of the system, provide support, and optimize the usage, as well as a Lenovo-specific photo viewer. A couple of standard games, like Candy Crush Soda Saga are included too﻿, but those should probably be removed. Regardless, the desktop was not cluttered with icons, so overall I was impressed with the lack of bloat. Unlike some other Ultrabooks, the X1 Carbon does have a fan. It's situated on the bottom of the device, but in my testing I found that it rarely ever turned on, except during the video benchmarking tests. Even then, the fan noise was barely perceptible. The device also stayed very cool to the touch during normal daily use. While benchmarking, it felt slightly warm to the touch, but nothing that would be too noticeable in use. 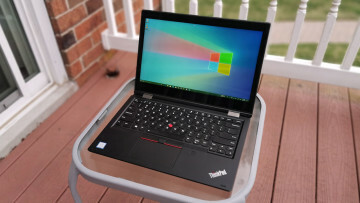 If you're a fan of Lenovo laptops, you'll absolutely love the refinements and upgrades the company has made to the fifth generation ThinkPad X1 Carbon. The keyboard remains one of the best in the business, and the flexibility to use the TrackPoint or ClickPad to move your cursor, as well as having buttons both above and below the ClickPad itself, make using the device a pleasure. 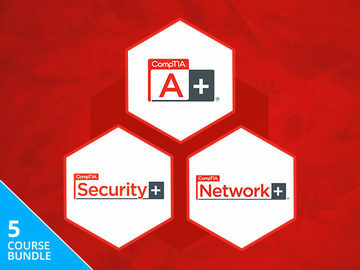 While individuals may not care about some of great security features, such as a quality fingerprint reader, a tamper-resistant TPM chip, and vPro, enterprise buyers will love them. 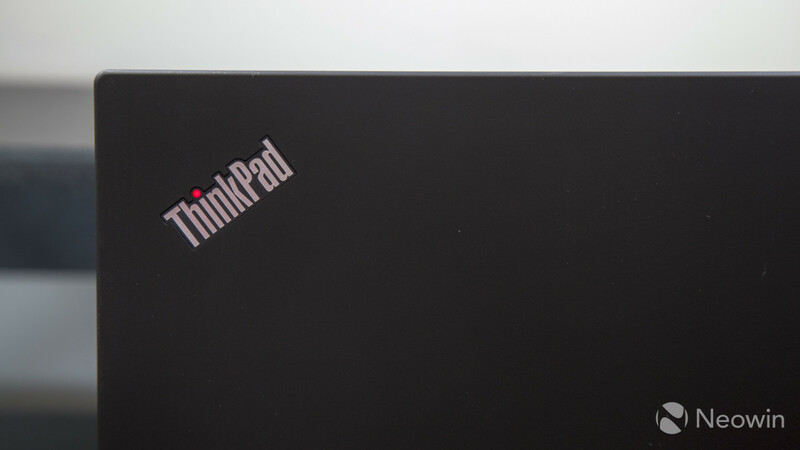 There really are very few things to dislike about the ThinkPad X1 Carbon. While I've grown used to using a touchscreen, not everyone will agree that the lack of this feature is a negative. The function key is where I would expect the Control key to be, but that's an oddity that can be learned. That leaves price as the main negative for the laptop, and though it's expensive, it's not out of line for a high quality, enterprise-ready device. UPDATE: User warwagon asked to see the device with the bottom removed, so I'm adding that image here. The back of the ThinkPad Carbon X1 is held on with five small Phillips head screws and then snaps out. You can tell that the components are not meant to be user replaceable, which is common with Ultrabooks due to the density of the devices.